The local residents of northern Larimer County, Colorado have petitioned the County Commissioners to "vacate" County Road 43F to the public, which dead ends at the Virginia Dale Stage Station. The local rancher and the Virginia Dale Community Club, who own the historic Stage Station, have already erected a locked gate. On January 7, 2002, the Larimer County Commissioners voted to permit an"unlocked" gate. The Virginia Dale Stage Station property, placed on the National Historic Register in 1985, was granted to the Virginia Dale Home Extension Club (later renamed the Virginia Dale Community Club) in the 1940's by Mr. Fred Maxwell, a pioneer in the county, and cattle rancher. It was Mr. Maxwell's intention was that this site be used for "public enlightenment and education. " His will also states that he was deeding the Stage Station "to the community for their use, thus preserving for posterity a most historic building. " He also granted his large ranch, The Maxwell Ranch, along US 287 and County Road 37 to the Colorado State University at Fort Collins for a research facility. He was extremely proud of his part in the taming and settling of the west. His wife, Mrs. Maude Maxwell, was an active member of the Virginia Dale Extension Club until she died in 1968 at the age of 92, and supported him in these intentions by her own co-operation and desire to leave the Stage Station property in "good hands." One of Mrs. Maxwell's fondest wishes was to convert it into a museum filled with arrow heads, animal heads, and other native objects that she had collected. It is sad that such a group of short-sighted individuals are now attempting to thwart the intentions of these pioneers of Larimer County. In 1996 the Colorado State Historical Society granted the Virginia Dale Community Club over $30,000 to stabilize the station, built in 1862 by the notorious Jack Slade. It had become ravaged by wind and weather over the 130 plus years of its existence. The Virginia Dale Community Club has since then worked underhandedly to close public access to the Stage Station, and if this effort suceeds, the public will never again be able to visit the Stage Station, or honor the memory of those buried on the grounds. 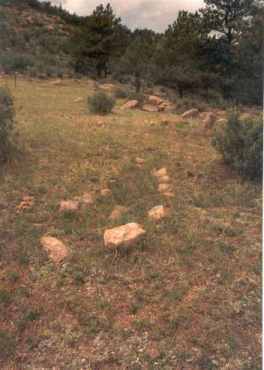 There are several graves situated on the Stage Station property. (See photo to the left.) One is that of Mrs. S. Leach, a postmistress who with her husband owned the stage station from 1868 to 1875, having purchased it from Ben Holladay. A decendent of Mrs. Leach, Linda Baker, and two of her relatives, recently traveled to Colorado to visit the grave of her great grandmother. Upon arriving at Virginia Dale she encountered the locked gate. After making several phone calls, she was able to view the stage station, but was denied access to the grave site. The actions proposed by the Virginia Dale Community Club have the potential to be far reaching, as other historic sites along the trails west situated on private property, heretofore accessible by public roads, may follow their lead and petition to have the public roads closed. Your help is needed now! Subject line: Closure of County Road 43F. It has come to my attention that the Larimer Colorado County Commissioners have allowed the closing of County Road 43F by a gate which leads to the Virginia Dale Stage Station. Currently this gate is locked. 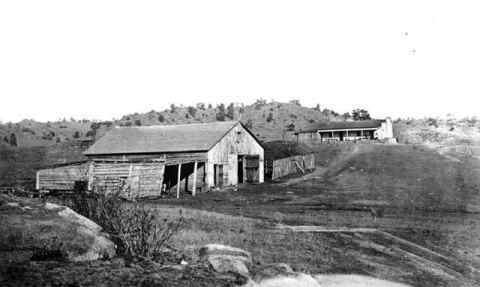 This violated the word of the law, as well as the intentions of the Larimer County pioneer, Mr. Fred Maxwell, who donated the land to the Virginia Dale Community Club. His will states that this site be used for "public enlightenment and education"and that he deeded the Stage Station "to the community for their use, thus preserving for posterity a most historic building." I object to the closing of this road and the manner in which it was done. I urge you to take steps to remove the locked gate immediately, and to take no further steps to prevent the public from viewing this historic site, and honoring those buried there. Please take the time to read some of the letters sent to the Larimer County Commissioners. (More information about the historic Virginia Dale Stage Station including the graves how the station looks today, and preservation and restoration plans halted in 1997 by the surrounding ranch owners.